At anytime during autoskipping press the to stop with autoskipping. Credits can be skipped in subsequent playthroughs by pressing once they are viewed once. 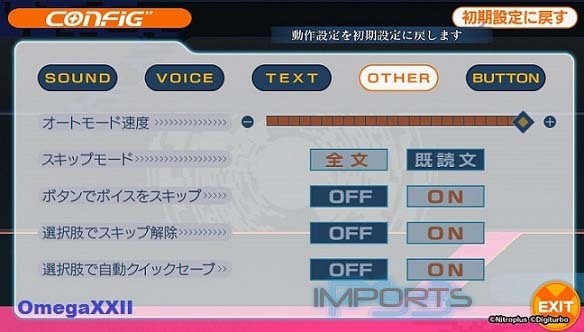 Note: These configurations are based on Type A controls, if you switch the controls they will be different. Go into Config and apply these settings, press the & button to switch screens. 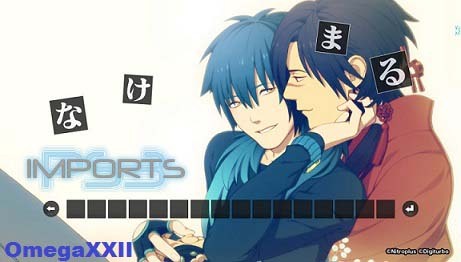 Saving: After clearing a route this screen will come up, Always select YES twice. Extra Tip: At certain points in the game you will come across timed choices where you need to make a save, I posted pictures to show where this would be. Good news is that the game does various automatic quick saves so if for some reason you weren't quick enough to make a save when indicated you can go back using a quick load by pressing to go back to a previous point before creating that save. Pictures: I am the original creator of these images. 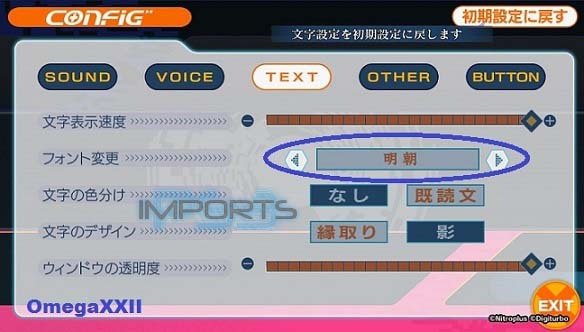 Once you get to the screen above, you must put the four kanji symbols in order, to do so select the symbol and press to confirm, to cancel a mistake press once done go to the right arrow and press once again. Please choose Yes to save settings. THIS IS A TIMED CHOICE! Now you must answer 9 questions correctly before the timer runs out. The following choices ARE GIVEN to you randomly each time. You must select either YES or NO before the timer runs out. Press the directional buttons to select a choice and press circle to confirm, you can also use the touch screen to answer these Once all windows are cleared you can proceed with autoskipping. Tip: If you mess up during this mini game it will take you back to the last question you answered, answer this question correctly again and then select the right choice, if you start to answer too many wrong questions in a row the mini game will end and you will get a bad ending. Cheat Sheet Answers: If you are somehow struggling to clear this, you can use the answer to the questions below as a guide, I strongly recommend you abuse the PS Vita Home Button to pause the game while doing this. One thing I might add - for the yes no quiz you can simple use SQUARE button to stop it on screen. No need to use PS button and making your screen small and hard to check. 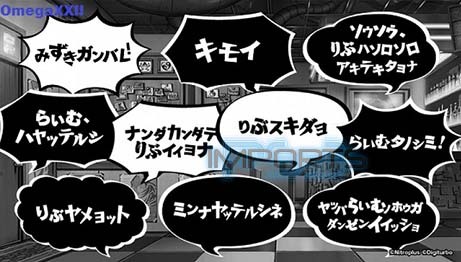 Simply select a white text bubble by pressing circle, it does not matter which one it is as this is also a random mini-game, once its done continue with auto-skip. 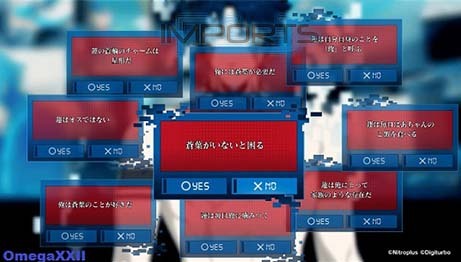 Now you must select only the black text bubbles by pressing ,once you destroy all the black bubbles continue with auto-skip. Guide is complete, any questions or feedback is welcomed. looks good just waiting for it to arrive to plat it ! Thank You Hakoom, I will use that as my banner. This answer is double posted. Ohterwise the guide is perfect. My time for plat was 1h 10min. That was a copy/paste error, fixed, glad to hear that the guide is working perfectly . Got the plat in no time with a small break.